Is the Raleigh Women's March affiliated with the national Women's March organization? Women Mobilize NC 2019 Pledge: Together, we pledge to defend and support communities under attack including women, immigrants, working families, Muslims, people of color, LGBTQIA+ people, Jews, refugees, & people with disabilities; to fight attempts to institute a Muslim ban and to reject Islamophobia; to oppose the attacks on the transgender community; to support #MeToo, holding people accountable for sexual assault, violence against women, and supporting survivors; to work for equal access to voting and voting rights, including challenging gerrymandering and voter suppression and disenfranchisement tactics, as well as supporting hand counted paper ballots and verified vote; support living wages, affordable health care, reproductive health care, paid family & sick leave child care, adequately funded public education, and common sense gun regulations; to support investment in our public schools, health care, safety, and infrastructure, and opposing unfair taxes; working to protect our air, water, and land; to oppose racially biased policing & mass incarceration, and deportations that tear apart families; to support DREAMers and fight for DACA. The weather in January is variable and unpredictable. Temperatures could be below freezing or mild. It could be raining, snowing, or sunny. Temperatures usually climb during the midday, so please check your hourly weather report and dress in layers. Wear comfortable walking and standing shoes. Hand and feet warmers may be warranted. Bring small back packs, resusable water containers, and snacks. You may want a moderate amount of cash to purchase tee-shirts and buttons as well as food and beverages from food trucks or local merchants. You may bring banners, flags, and signs, but posters or signs held up with sticks are forbidden. DO NOT BRING: weapons or anything that could be a weapon, including sticks, pocket knives, multi-tools, mace, scissors, or box cutters; illegal drugs. There will be accessible portapotties and a special area for people with disabilities. Translators for ASL also be available. 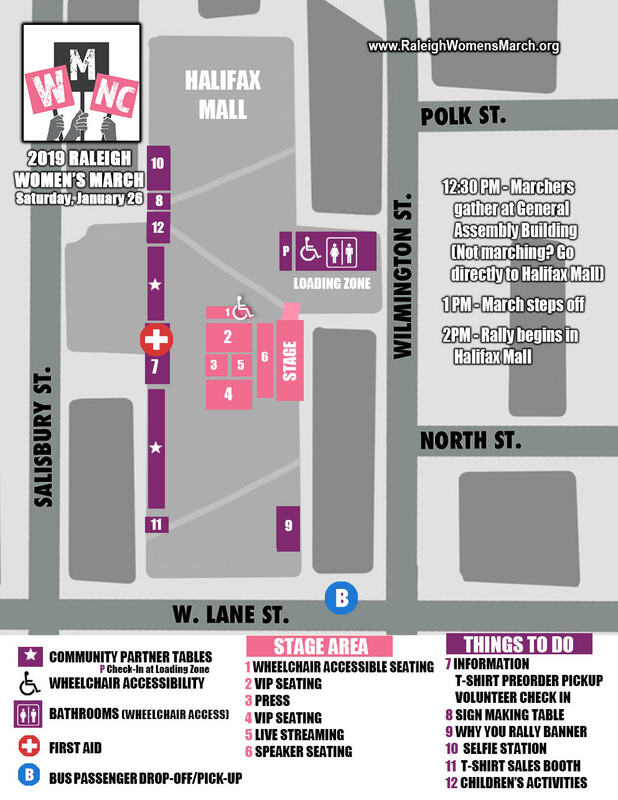 There will be several events occurring in downtown Raleigh near the sites of our march and rally, so plan to have several parking options. You may wish to carpool with your friends and family. GO Raleigh, the City of Raleigh's transit system has a new 2019 schedule. 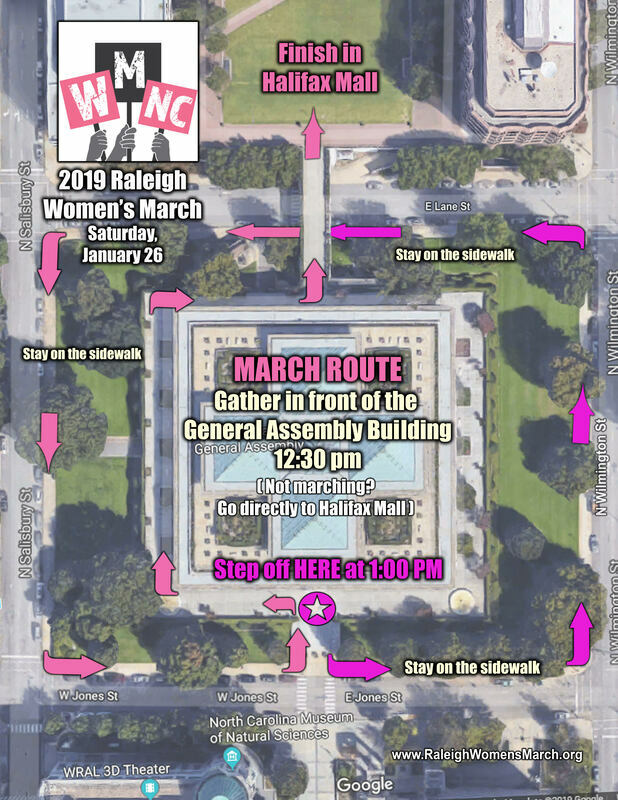 Women Mobilize NC is accepting proposals for sound, stage, and audiovisual for a rally taking place on Saturday, January 26, 2019 at the Halifax Mall located in downtown Raleigh. To learn more about sound, stage and audio visual needs review our request for proposals. MomsRising will lead children's activities at Halifax Mall, including decorating a megaphone, coloring pages, and petition signing (official and artistic, to be delivered to the NCGA).